New Indices and statistical calculations come to the forefront because either there is something blatantly wrong or the index is not a reflection of reality. Duckworth Lewis came into play after the match between South Africa and England in the 1992 World Cup ended up with South Africa needing 21 runs off 1 ball. The flaw in the “most productive” overs got exposed because South Africa had two overs that were maidens. The Duckworth Lewis system finally got implemented in 1999. That was a case where a change came about because the system was proved to have weaknesses. I am a big fan of alternative indices. The Jayadevan system is a good alternative to Duckworth but there is so far nothing significantly wrong with Duckworth to warrant a change. The Jayadevan system may be too complicated to explain to the common follower of cricket to explain the system. I believe that it would be extremely beneficial to test the system out at one of the T20 premier leagues. The Indian Premier League would be the best. In fact, it was supposed to have been implemented there. The second reason I have stated is that different indices are used when the main index is not a reflection of reality. A classic example of this would be the difference between the ishares MSCI emerging market index and the Vanguard FTSE emerging market index. The ishares index has a 15% exposure to South Korea. South Korea by no means is an emerging market. Similarly, the ishares S&P GSCI index has a 70% exposure to energy. The PowerShares DB Commodity Index has 50%. When I first started looking at Exchange traded funds I had to make a convincing argument to use the Vanguard Emerging Market ETF and the PowerShares DB Commodity index rather than the alternatives because they were bigger. Just because most of the people used those indices then that does not mean they were right. Today the Vanguard Emerging market ETF and the PowerShares DB Commodity Index is bigger than their former rivals. 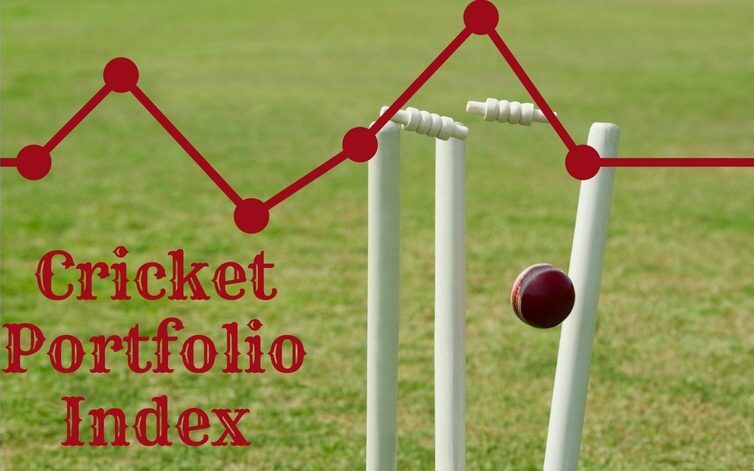 The main reason for creating my Cricket Portfolio Index is because I think that the ICC ranking is not reflective of reality. Below are the ICC Test rankings. A natural question to ask is if there are so many South Africans in the top 10 then why are they not higher on the list. I recognise the fact that India is ranked higher on average points but the simple average is completely misleading. A team that plays more matches has a greater chance of getting more points. At the same time, they also have a greater chance of losing points. If the teams were investments then I would make more money if I had to liquidate the South African Investment than the Indian one. David Kendix who designed the system approached the ICC ranking as an actuary and a statistician. I view it as investment portfolios. There are twelve test playing teams and therefore there will be twelve portfolios. Mr Kendix has done a really good job on the rankings but I believe that the ICC ranking still has quite a few biases that are commonly seen in financial indices. In some cases, Mr Kendix attempts to remove certain index bias has turned out to be negative because the good that comes from those indices have also disappeared. I have listed the main index biases below and mention how the ICC deals with them and how my system differs to the ICC specifically in relation to these biases. 1) Classification Bias: We do not live in a cricketing world anymore where each player has clearly defined roles. A great Wicket-Keeper with average or below average batting will always be lower down in the pecking order than an average keeper who bats extremely well. Batsmen are easiest to classify as they generally do not bowl. Sometimes even they would have to put in a few overs either to give the main bowlers a rest or to add a little bit of variety. Everybody is expected to score runs. Bowlers are no exception. If by chance they happen to score well then those are just bonus runs. The ICC multiplies the batting points by the bowling points and divides that by 1000. If someone does not get any points ie. their batting points or bowling points are zero then they do not appear on the list. In the top ten of the all-rounder list, you probably have five genuine all-rounders. The others are there because they bowled really well and batted a little. Finding out whether a player is an all-rounder is as easy as to check their role in the team. England uses Ben Stokes as their fourth seamer and Moeen Ali as their second spinner. Moeen got dropped because he was not bowling well and neither was his batting backing him up. This essentially meant that the main bowlers were shouldering all the bowling. My system will give All rounders a higher chance of scoring more points. The penalties in tests will not be as significant as in ODI or T20. My algorithm is designed in such a way that pure batsmen and pure bowlers are also given a fair shot. If you have five batsmen and the wicketkeeper who can get you the runs followed by five bowlers that can get you 10 wickets then there is no need for all-rounders. 2) Survivorship and Attrition Bias: The ICC ranking removes the results of matches scored between the 37 and 48th month every May. Further, the matches played up to 24 months gets counted but those before that get a 50% weight. This index has tried so hard to remove survivorship bias that it has gone and created a different set of problems. Giving a weight of 50% to matches older than 24 months implies that batsmen either become 50% worse off after two years or that 50% of your team no longer exists with a side being completely changed after four years. Can you imagine what the results would be if such a thing actually happened in teams? If players retire or are dropped then their results will still be reflected for a period of time. Chopping and changing of players in teams have little impact on the ICC rankings. My solution to the survivorship bias was to take the performance of the playing XI in the team. A team can be ranked number one before the start of the test series. If they make changes in their teams and bring in uncapped players then they will lose points and may end up starting that series with a lower score than their opponent. As mentioned earlier I view each team as a portfolio and each player as a constituent of that portfolio. If a player is not playing then he has no place in that portfolio. 3) Selection Bias: By ignoring previous data of players and teams; there is a heavy selection bias that seeps through all the pores of the ICC ranking. Past performance is not a guarantee for future results but those results should not be ignored. A player should not be allowed to either jump up rankings or have his performances negated just because they do not fall within a specified time. I do not have any intention of removing player performances just because they are dropped or a period of time has elapsed. 4) Series and Team Bias: The ICC gives bonus points for a series win. I do not believe this should be the case. I assign scores to players and their scores are reflected in the team scores. There is no point in assigning a team further points. Playing longer series are more rewarding than playing shorter ones. This should not be the case. I completely agree that there are weaker teams and stronger teams. I do believe that if a team is deemed worthy to be playing test cricket then they should be able to play on the levels demanded by Test Cricket. I do not give any weight to stronger or weaker teams. The ICC considers weaker teams to be where the difference in points is greater than 40. Considering this India which has 125 points as of 15th May 2018 has only Bangladesh, West Indies, Zimbabwe and now Ireland and Afghanistan as weaker teams. Australia who is ranked third has only Zimbabwe, Ireland and Afghanistan as weaker teams. Australia has cancelled the series against Bangladesh for financial reasons. Based on the ICC ranking system; they have cancelled a test series against an equally strong side. Classifying a team as stronger or weaker is meaningless. The way Ireland played against Pakistan only proves this point. In my system players are rewarded and penalised for certain milestones. Batting points are given for reaching 50,100 etc. In ODI & T20 points are given for 4’s and 6 as well as maidens but they don’t figure in Test matches. Fielders get more points for catches than Wicket Keepers but Wicket Keepers benefit a lot from stumping. I do not differentiate how the bowlers get their wickets. What matters is how much they get and what their strike rate is. I start each team with 1,000 points as on average they should be getting this per game. A significant loss would be one where the losing team gets 25% less than the score at which they finished at. A significant win would be an increase of 30% for the winning side. None of my calculations is subjective. In creating this index I expect to see results that more accurately will portray the performance of who are the best players and teams. I hope that I will have sufficient data by the time the Test championship starts and check how the final two teams differ from what my index shows. Previous Previous post: Doing away with the toss?